A Colombian Copernicus? Jagiełło in New York City? Karol Wojtyla in East Timor? Culture.pl goes global to explore the stories of monuments to famous Poles around the world. How did the leader of the Polish-Lithuanian Commonwealth come to find himself in New York City? Well, like many of his fellow countrymen, Władysław Jagiełło was displaced when war broke out in Poland and found refuge in New York. In this case, the towering bronze statue of the esteemed leader was on display in front of the Polish Pavilion at the 1939 World’s Fair when the Nazi Germans invaded Poland. Unable to be returned to an occupied Poland, most of the collection of the pavilion was sold to the Polish Museum of America in Chicago, with the exception of the statue of Jagiełło, which remained in New York and took up permanent residence in Central Park. From the moment of its unveiling in the United States, the statue of Jagiełło was seen as a symbol of Poland’s strength and perseverance – a message that only grew stronger following the Nazi invasion. Over this miniature Poland, with its story of peaceful pursuits and achievements, there stands on guard the symbol of armed might which once before saved Poland from an armed invasion. It is a symbol of the lesson of which is understood today and will remain many, many years after the Polish Pavilion and the New York World’s Fair have receded into distant memory. Facing the looming threat of German aggression, the sight of Jagiełło on horseback, brandishing the two swords with which he led the commonwealth to victory against the Teutonic Knights in the 1410 Battle of Grunwald, was particularly poignant – Poland prevailed back then, and would again. Following the Polish victory at Grunwald, Jagiełło brought the two swords back to Kraków, where they became a symbol of his reign over the united Poland and Lithuania. Today, in New York’s Central Park, they remain a symbol of unity and strength and are a testament to the long relationship between Poland and the United States. The Jagiełło statue is the site of international folk dance gatherings, further underscoring its significance as a place to remember and celebrate the blending of cultures. It seems Potocki’s 1939 dream that the statue would ‘stand as a symbol of the peaceful pursuits of the Polish people and their desire to strengthen and maintain their bonds of sympathy with the United States’ has become a reality. He was the man who ‘stopped the sun and moved the earth’. And in the almost 500 years since his death, Mikołaj Kopernik has moved all over the earth, with statues and institutions dedicated to the legendary mathematician being erected around the world. 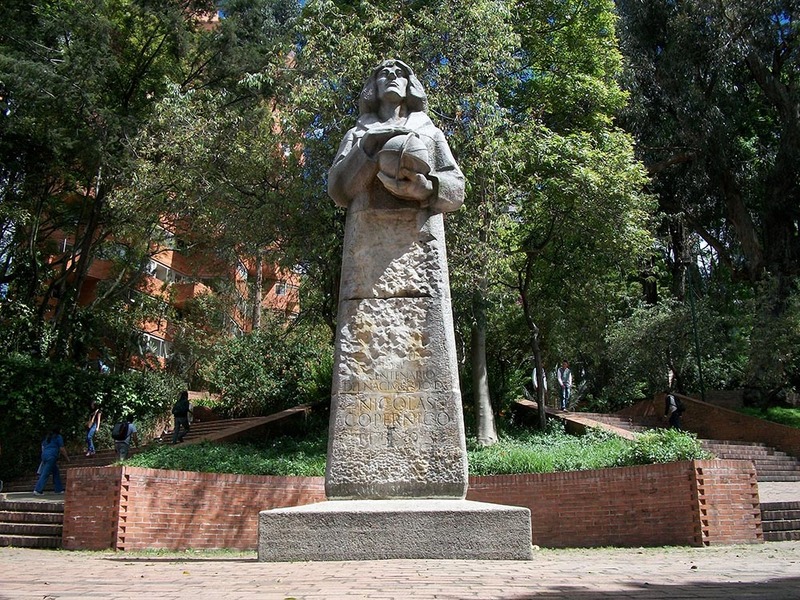 Amongst these monuments, one can imagine Copernicus would have marvelled at the statue in Bogota, Colombia, a place unknown to Europeans when he was born. Erected to celebrate the anniversary of his birth, the Colombian monument was created by Tadeusz Lodziana. The sandstone sculpture stands six-metres high and depicts the mathematician holding a globe, with his robes creating the form of an obelisk below. Located in Independence Park near the District Planetarium, the Colombian Copernicus overlooks a new generation as they explore the heavens. 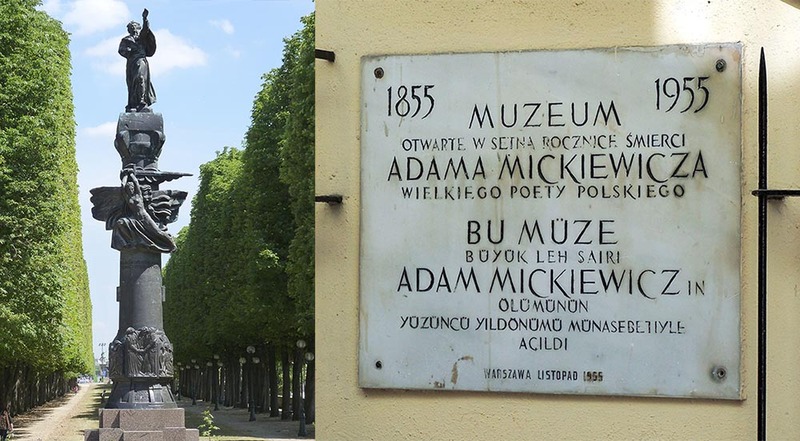 It’s hard to overstate the significance of Adam Mickiewicz in Polish culture – his verse is memorised by schoolchildren, his name graces universities and cultural institutions, his ideas arguably continue to shape national consciousness, and monuments to the Romantic icon feature prominently in Polish history. The Mickiewicz monument in the heart of Kraków was taken down almost immediately after the Nazi occupation of the city, and its restoration was a sign of Poland’s resurrection after the war. The statue of the national bard in Warsaw was the site of student protests in 1968 following the forced suspension of a performance of Mickiewicz’s Forefathers’ Eve and helped spark demonstrations that united the general population against the communist regime. So, while it’s not hard to understand why there are monuments to Mickiewicz all over Poland, it might not be so clear why he’s also honoured with a towering bronze statue overlooking the Seine in Paris or a commemorative plaque in Istanbul. That is, until one thinks about the life of adventure lived by the 19th century poet. Born in Nowogródek (then part of the Russian Empire, and today located in Belarus – both Lithuania and Belarus are now home to numerous statues of the poet), Mickiewicz’s life took him all over the map of Europe. He spent time imprisoned in Vilnius (there’s a monument to him there too) and later mingled with elite progressive circles in Russia (yep, he has monuments there too). In 1829, he embarked on a grand tour of Europe, visiting Germany, Switzerland and Italy. He eventually settled in Paris, where he wrote and taught until the journey to Istanbul that cost him his life (a plaque marks the house in which he died). Though life in Paris wasn’t easy for the poet, the city shaped Mickiewicz and Mickiewicz shaped the city. He composed verse on Paris and was active in Parisian social and literary circles. He was the inaugural chair of Slavonic Literatures at the College de France, and made a deep impression on those who witnessed his largely improvised lectures. Having left his mark on the literary landscape of the city, Mickiewicz entered the physical landscape in 1929 when a monument to the poet was dedicated to him (it was originally designed in 1909, but its implementation faced a number of delays). The towering column, designed by Antoine Bourdelle, was financed by the Association France-Pologne and is topped by a statue of the poet. A depiction of a heroic Polonia is featured underneath him and the bas reliefs depict figures and text from some of Mickiewicz’s best-known works. Fragments from Mickiewicz’s Konrad Wallenrod are accompanied by images of Wallenrod with his sword, and the bard Halban with his instrument and a verse on captivity appears under people in chains. For a man so devoted to literature and nation, a monument featuring both seems a fitting tribute. Chopin’s music is beloved around the world. And, just as his music has gone global, so too have monuments to the composer. Visitors to Warsaw have certainly seen Wacław Szymanowski’s romantic sculpture of the composer in Łazienki Park (the site of weekly Chopin concerts during the summer months), but many might not know that the same statue can be found in Hamamatsu, Japan. The city honoured the composer with a replica of the iconic monument in 2010. 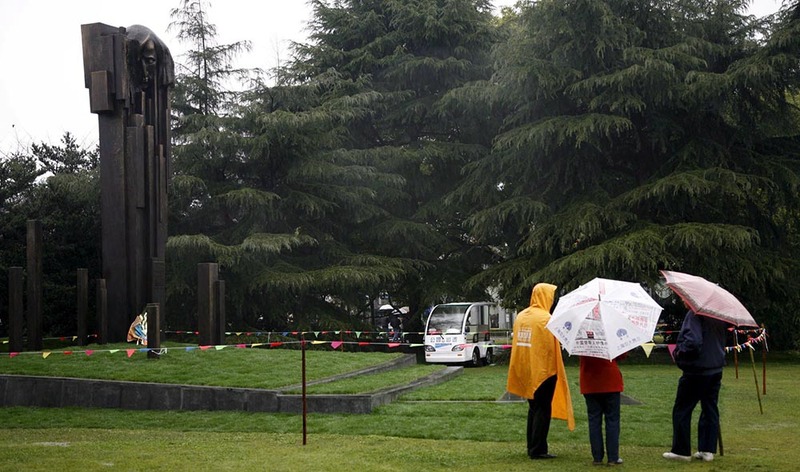 Meanwhile, the tallest Chopin monument in the world is found in Shanghai’s Zhongshan Park, where a striking seven-metre tall column features the face of the composer surrounded by a collection of abstracted piano keys. The work was designed by Lu Pin, a Chinese artist educated at Warsaw’s Academy of Fine Arts. Across the ocean, the first monument to Chopin in South America was unveiled in 1944 – a year in which the symbol of enduring Polish culture took on particular significance as the nation itself struggled under occupation. Plans for the monument were actually sparked by the destruction of Szymanowski’s monument to Chopin in Warsaw by the occupying Nazi Germans – an affront that inspired the Polish community in Brazil to raise funds for a monument in Rio de Janeiro. It is just part of the long history of Polish culture in Brazil. 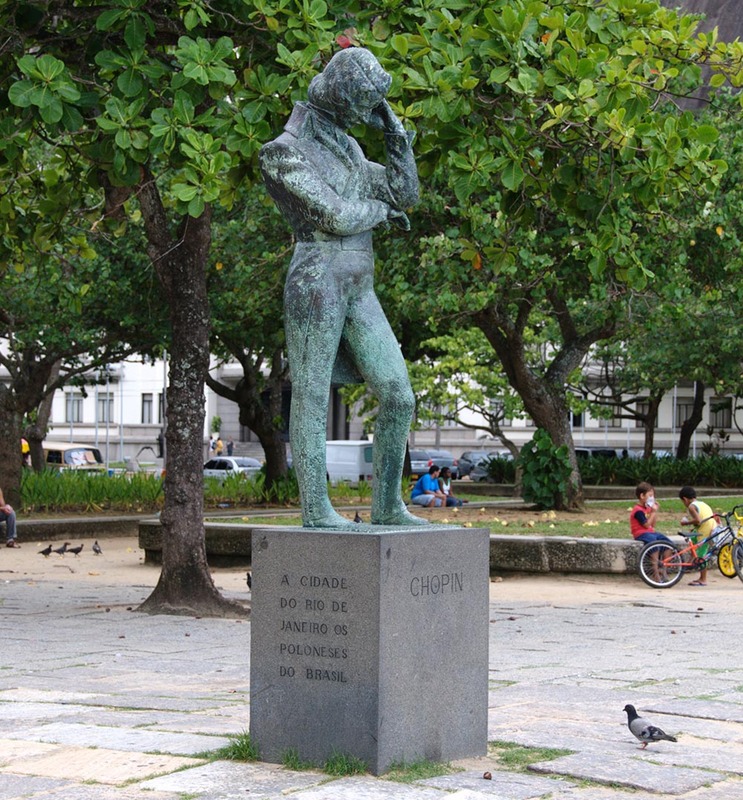 Designed by August Zamoyski, a Polish sculptor who spent the war years in Brazil, the statue of the composer today stands on the shore of Playa Vermelha. As he looks out over the water towards Europe, the figure of the elegantly-dressed composer lost in thought evokes a longing for his homeland – a longing that was not only Chopin’s, but shared by fellow Polish exiles across history. The salt air from the sea has certainly taken its toll on the bronze sculpture, but perhaps the erosion only adds to the melancholy of the memorial. Describing Tadeusz Kościuszko, Thomas Jefferson remarked he was ‘as pure a son of liberty, as I have ever known’. 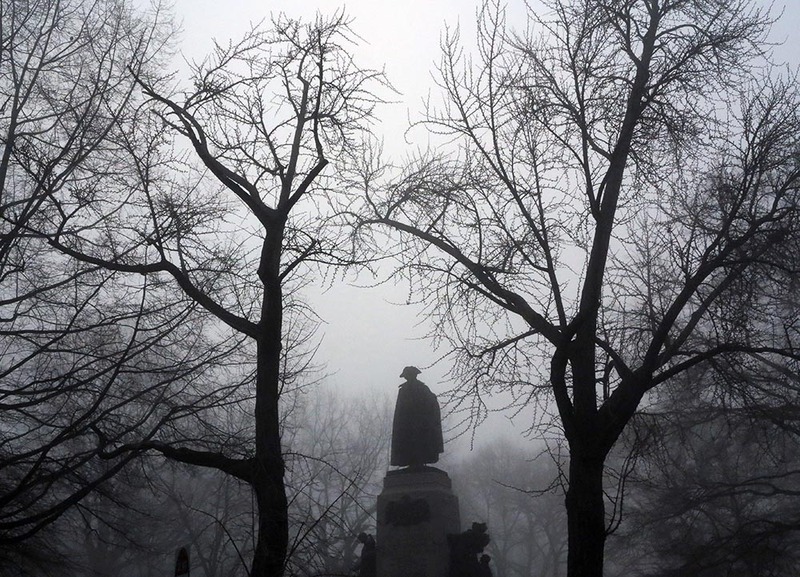 A hero of the American Revolution and close friend of the country’s founding fathers, it is no surprise that a monument to Kościuszko stands in the nation’s capital. 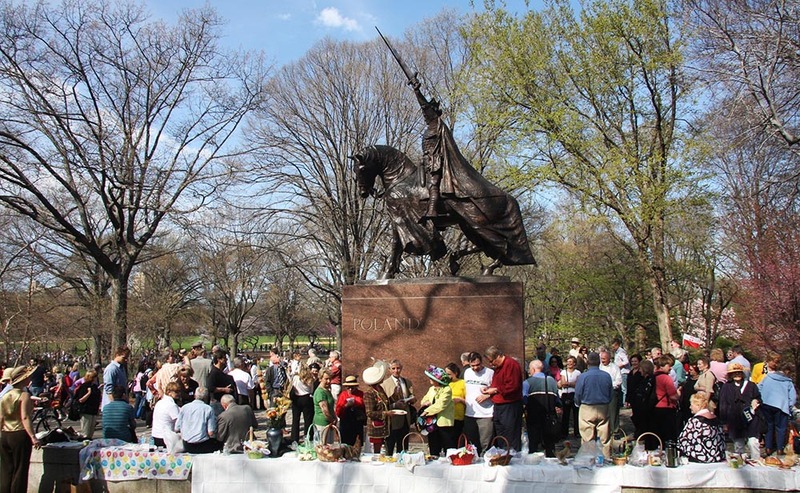 Two shrines of flashing bronze, martial and majestic, were added to the Capital’s proud Pantheon of the Revolution yesterday, when statues of Count Casimir Pulaski and Gen. Thaddeus Kosciusko were unveiled. The spirit of the warlike polonaise swept down Pennsylvania Avenue, when thousands of Polish-Americans, assembled in Washington to honor two fellow-countrymen who helped ‘to give a new birth of freedom in the promised land’, marched past President Taft and his entourage after dedicating the first of their memorials to the republic. (…) The booming of cannon, the blare of brass, the cheering of multitudes braving the inclement weather, the glowing praise of the President for the two revolutionary heroes, all combined to bring Polish-Americanism to its zenith. Located in Lafayette Park, the bronze statue depicts a standing Kościuszko, holding a map of the fortifications of Saratoga in his right hand, while his left clasps his sword. Designed by Antoni Popiel, the monument highlights Kościuszko’s role as a military hero both in the US and his native Poland. The granite base of the sculpture features two globes – one showing America and the other Poland. Both are topped with eagles, a symbol shared by the two nations. The other two sides of the tiered square depict Kościuszko both in the uniform of the US Army and the Polish military. The inscription on the south side reads: ‘And freedom shrieked, as Kosciuszko fell’ – a quotation from Thomas Campbell’s 1799 poem The Pleasures of Hope and a fitting tribute to the great hero. The people of the United States receive with no mere formal courtesy this statue presented by their fellow-citizens of Polish blood. (…) All over this broad land the judgment is that Kosciusko is worthy of a statue, even if statues were rarely coted, and that no place in this country is so high or honourable that it will not be graced by its presence. In the century that followed, Kościuszko has indeed come to grace a number of places around the United States. Towns, roads and bridges all bear his name, and statues of the military hero can be found in a number of American cities, including Chicago, Philadelphia, West Point, Boston, Detroit and Milwaukee. 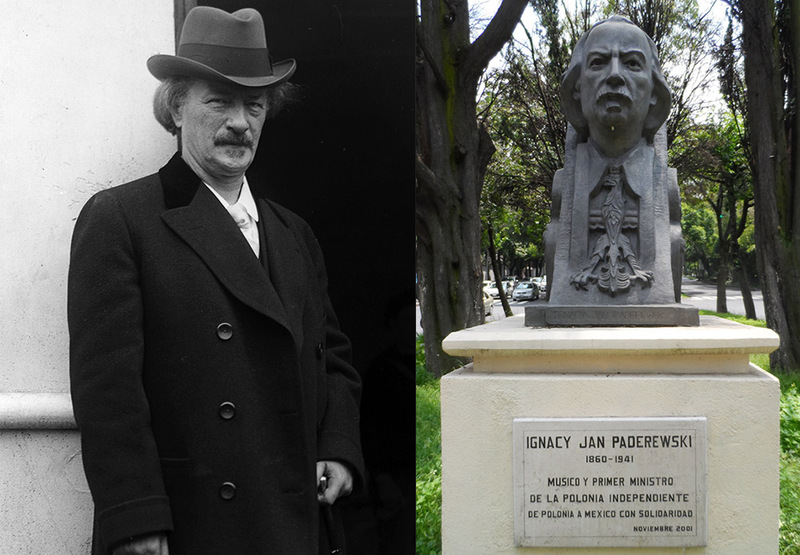 When you think of the music of Mexico, Ignacy Jan Paderewski probably isn’t the first name that comes to mind. Yet the Polish pianist found great success there – first invited to perform in 1884 by President Porfirio Diaz, Paderewski returned for at least four additional concerts in the years that followed. Today, a statue of the Polish musician can be found on Paseo de la Reforma, the main avenue of Mexico City. The work of the Spanish sculptor Miguel Baquidano Camps, the three-metre-tall bust depicts Paderewski with a Polish eagle on his chest. The centrality of the Polish symbol is not accidental – the historian Tadeusz Łepkowski noted that when touring in Mexico, Paderewski’s Polish identity was also highlighted in the Mexican press, a politically significant choice, given Poland’s absence at that time from the political map of Europe. Though initially unveiled in 1945, the statue was not officially revealed until almost 60 years later, due to efforts by the communist regime in Poland to block the project’s funding. Although I did not speak Spanish at that time and we communicated with the help of an interpreter, he left a great impression on me. He was a human being that deserved attention. Just as Paderewski had great respect for Mexico, it seems the Polish musician and statesman similarly left a great impression on Mexico. It’s not surprising that there are statues of Pope John Paul II everywhere, because he travelled everywhere. While his native Poland is home to the biggest of these monuments (over 13 metres high! ), one can imagine John Paul II would have appreciated the more modest 6-metre statue overlooking the Tasitolu coastline in the southeast Asian nation of East Timor. In 1989, John Paul II’s visit to East Timor was the first of any world leader to the territory – since it had been annexed by Indonesia in 1976, official visits were considered a risky political move. At the time, East Timor was embroiled in its ongoing struggle for independence and free expression. Respect of the rights which render life more human must be firmly insured. (…) For many years now, you have experienced destruction and death as a result of conflict. You have known what it means to be victims of hatred and struggle. Many innocent people have died while others have been prey to retaliation and revenge. One might hear in these words an echo of the Pope’s message of perseverance and demand for freedom delivered in Poland, as his homeland fought its own battle for freedom. In 1989, just as Poland was beginning its transformation to full self-determination and democracy, East Timor was still fighting and John Paul II’s speech resounded as an inspiring message of hope. 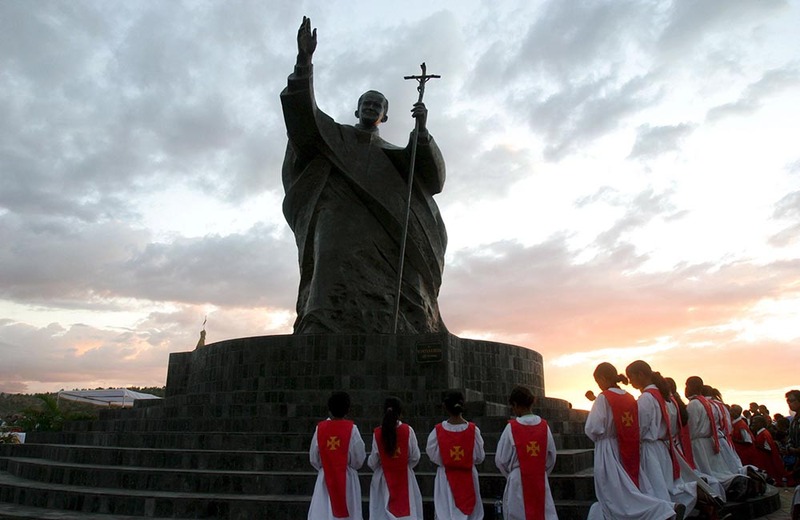 Erected in 2008 to commemorate his visit, the statue of John Paul II overlooks the coastline, as well as the field in Dili where the riots took place following his 1989 mass. The large sculpture depicts the Pope’s flowing robes in heavy, angular bronze. The familiar face of the pontiff looks out over the water, his hand raised in a gesture of peace to the people of East Timor. We’ve covered only a handful of the world’s monuments to Polish figures here. Have we missed any of your favourites? Let us know in the comments!